Thomas Hynes is CEO of Colliers International’s Boston office, a full-service commercial real estate firm. 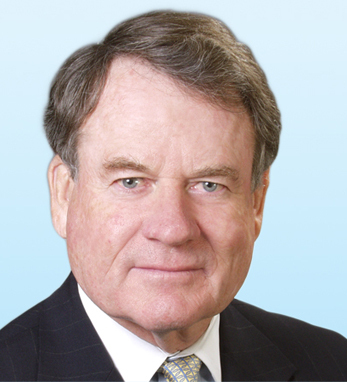 In his 50 years with the firm, Thomas has represented a wide variety of tenants, institutional and corporate owners, developers and users of real estate. He was appointed president in 1988 and chairman in 2007. Tom has been the recipient of a number of real estate honors, including The Most Ingenious Deal of the Year award by The Real Estate Board of New York as well as the Boston Lease Deal of the Year from the Commercial Brokers Association for a 475,000 ft2 lease of the Prudential Center. Tom is a Boston native, a graduate of Boston College, and a second-generation Irish American whose grandfather emigrated from Galway and whose uncle, John B. Hynes, served as Mayor of Boston from 1950-1960. When his father died in 1949, leaving a widow and five children, “the extended Irish on both sides of the family tree were always there to lend their support,” he says. Tom lives in Chestnut Hill with his wife of 44 years, Nicole Hynes. They have two grown children, Vanessa and Tod and a grandchild, Thomas (son of Vanessa).